Our 'A Million Moments Appeal' has enabled us to help over 5,000 children who are involved in the hospice system, by giving them the chance to enjoy the benefits of spending time in inspiring gardens and outdoor spaces. The following gardens fall under the umbrella of the A Million Moments Appeal, and are currently being created. 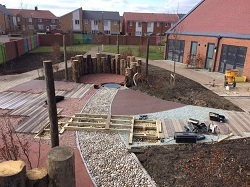 We're well on the way to finishing the "Nest and Rest" garden at Grace House which will provide a place for recreation and enjoyment for the children and families who use the hospice services and provide a safe and peaceful haven. This project has seen generosity from grant making trusts along with support from nearby Cowell’s Garden Centre, Johnsons of Whixley for plants, funds raised by those taking part in Garden Re-Leaf Day, Kew Green Hotels and many others. Featuring an interactive water feature, sensitive planting and sheltered areas, it will provide families with an invaluable outside space for respite and relaxation, as well as stimulating features that can be used for therapies and reflection. On the shores of Loch Lomond, we have been working with the hospice team at Robin House in Balloch, helping them with the design of two new therapeutic and stimulating gardens which we hope will become a reality next year. 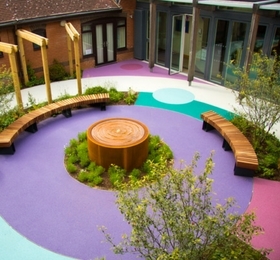 We are also looking forward to creating The Garden of Colour at Claire House Children's Hospice (Wirral), as well as sensory gardens at Little Harbour Children's Hospice (St Austell) and Richard House Hospice (Beckton, London) becoming a reality. The Courtyard Garden at Keech Hospice Care, Luton.